We only select the best quality ingredients and use the purest water. 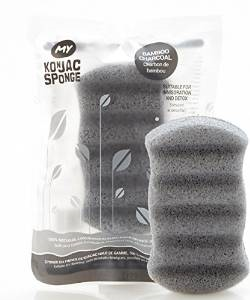 Our konjac sponges are made from 100% food grade konjac powder. Only by using the highest quality ingredients and precise manufacturing process, all konjac sponges that come out of our manufacturer are the highest quality konjac sponges in the market. We will never take the easy way out, never compromise what is best for your experience and well being, and never use any ingredients that has any potential to harm human. We guarantee that our products does not contain Fragrance, Artificial Color, Preservatives, Parabens, Talc, or any other additives that are known can cause cancer. Rest assure. When you use My Konjac Sponge, you know that quality isn’t an afterthought, but it is at the core and heart of everything that we do. My Konjac Sponge takes pride in handcrafting products that are all vegan, natural and free from any additives or chemicals that can harm environment. Our products are biodegradable and our packagings are recyclable. We are dedicated to the optimal working conditions for the manufacturing of our products. We do not test our products on animals in any phase of product manufacturing. We are a Leaping Bunny Certified company. Leaping Bunny provides the best assurance and sets the highest standard for animal cruelty free in the cosmetics industry. This high standard also applies to our ingredient suppliers. Developed by a mother who wanted to make sure everything for her little ones was safe and natural, our Konjac Baby Sponge is perfect for delicate and tender skin, including babies with sensitive skin or eczema. 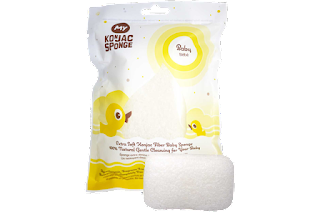 Our nonabrasive Konjac Baby Sponge can be used daily to help keep your baby’s delicate skin soft, smooth, and healthy. Gently massage the skin in a circular motion. Rinse after use, then squeeze out water & hang to dry. DO NOT WRING!!! Hang it in the well – ventilated place for air drying. The sponge can be sanitized by placing the sponge in a bowl of water and microwave it in a normal setting for 1:30 minute. We recommend to sanitize it once every two weeks. The sponge should last up to 3 months but once it starts to break, please replace it. The sponge can be composted after use. My Konjac Baby Bath Sponge is so soft and perfect for babies skin. I actually used this on my baby for his first bath and I love that it's all natural. It lathered with very little soap and worked great to clean every inch of my sons delicate newborn skin. I love that this sponge is PH balanced to help keep my babies skin healthy and soft. It worked great to wash my sons skin and I love that its reusable and can be disinfected by placing it in the microwave. Experience deep cleansing while removing dead skin cells with our Six Wave Bamboo Charcoal Konjac Body Sponge. Activated Bamboo Charcoal is an excellent natural exfoliant that has been renowned for centuries. It can effectively draw out dirt & excess oil that can clog pores & results in breakout. This one-of-a-kind body sponge can also absorb minerals, toxins, impurities, and harmful substances, leaving you with stronger, healthier skin. When you massage your body with this sponge made with 100% pure Konjac plant root, you will heal your skin both inside and out. - Rinse after use, then squeeze out water & air dry. To sterilized the sponge: Place the sponge in a bowl of water and microwave it for 1:30 minutes, OR boil the sponge in boiling water for about 2 minutes. We recommend sanitizing the sponge once every two weeks. Product is handmade in South Korea. The Six Wave Bamboo Charcoal Konjac Body Sponge works great to massage the skin while cleansing. I have always had minor breakouts on my back and since using this sponge my back looks so much clearer. This sponge has really helps to rid my back of the excess oil that causes my back to break out. My skin feels softer than ever and I credit it all to the Six Wave Bamboo Charcoal Konjac Body Sponge! Click HERE to locate a retailer near you to purchase your own. Follow My Konjac Sponge on social media! Before choosing a products especially baby product we used to go for the quality of the product. It helps to recognize how useful and effective the product was. Mostly in the market there are different types of baby products are available and it is quite tough to recognize the best one; so we need to follow the instructions of experts and from here we can get some good quality of information about baby sponge products those are especially used during bathing.